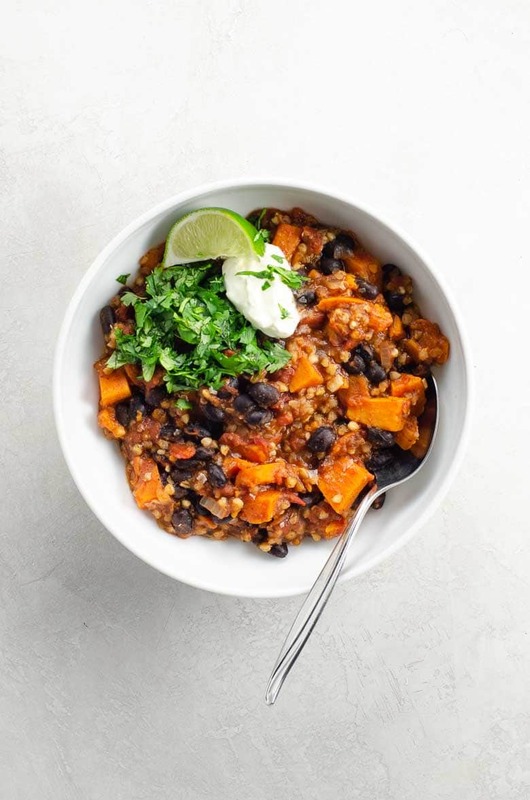 This hearty vegan chili with black beans, sweet potato, buckwheat and chipotle tastes like it took all day to make. But thanks to the Instant Pot, it's ready in about 30 minutes. Makes a big batch that only improves in flavor over the course of the week, so it's great for batch cooking and meal prep, or for feeding a crowd. Buckwheat may sound like wheat, but it's a gluten-free seed that cooks up tender and nutty. Look for raw buckwheat groats rather than toasted ones (kasha). Around here we like to cook. We like the process. The tinkering with flavors while a pot simmers on the stove. The tasting. The taking a moment out of a busy day, and once in a while taking a whole day out of a weekend. And sure, we like the wine. So although we do have an Instant Pot, we do not have an Instant Pot fetish. 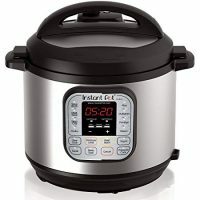 That means we don’t reach for the Instant Pot unless there’s a good reason, like truly saving time and attention on long-cooking or finicky ingredients without losing one ounce of flavor or depth. 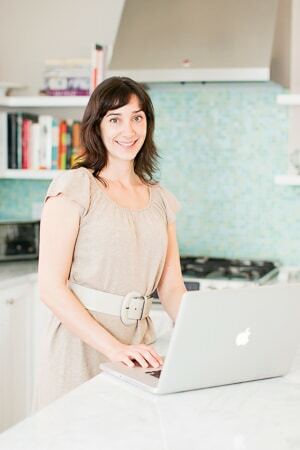 Or like producing as if by magic a healthy, hearty meal where none existed before, from ingredients easy to keep around, on days when you might otherwise order pizza. Also: none of that multiple-step, sautéeing, crappier-version-of-stovetop-cooking-so-we-can-say-it’s-an-IP-recipe nonsense. This hearty vegan chili recipe ticks both of those boxes. Chili wants to taste like it was slow-cooked all day and added to a big, heavy pot in layers. Sweet potatoes and buckwheat both need to simmer for a hot sec. Pressure cooking with a robust blend of aromatics and spices magically accomplishes all of these feats in under 30 minutes, and boy is this meal good for both your body and soul. 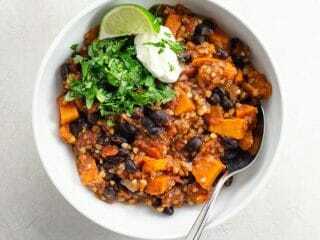 This hearty vegan chili with black beans, sweet potatoes, buckwheat and chipotle tastes like it took all day to make. Thanks to the Instant Pot, it's ready in about half an hour. Place all chili ingredients except lime juice into an Instant Pot and stir to combine. Cover, seal vent and cook on high pressure for 6 minutes, then release pressure manually. Stir in lime juice. Chili is ready to eat right away but, like all chili, will only get better over the next 24 hours. Ladle into serving bowls and garnish with lime wedges, cilantro, and vegan sour cream. Buckwheat is a grain-like seed that's gluten-free. It adds a mild nuttiness and lots of good texture and nutrition to this vegan chili recipe. Be sure to use raw buckwheat groats rather than toasted ones, which are usually sold as kasha.